Girl Most Likely – On Sale! Girl Most Likely is on sale right now at Amazon – $4.99 on Kindle (regularly $15.95) and $10.97 for the trade paperback edition (again, regularly $15.95). Signed copies of the book are available from vjbooks for $24.99. Last week I did a TV appearance on Paula Sands Live, the very popular local show on KWQC-TV in Davenport. Some of you may remember Paula from Mommy’s Day, in which she played herself…sending herself up somewhat, and really delivering. Then this past week – Thursday, April 4 – I made an appearance at the Dubuque Public Library, promoting Girl Most Likely (Galena is a short drive across the river from Dubuque). We had a very nice turn-out – sixty or so – and just about everybody bought books. Great people – fun and friendly, with lots of excellent questions. Among the crowd was my old pal Steve Moes, location manager on the two Mommy movies. 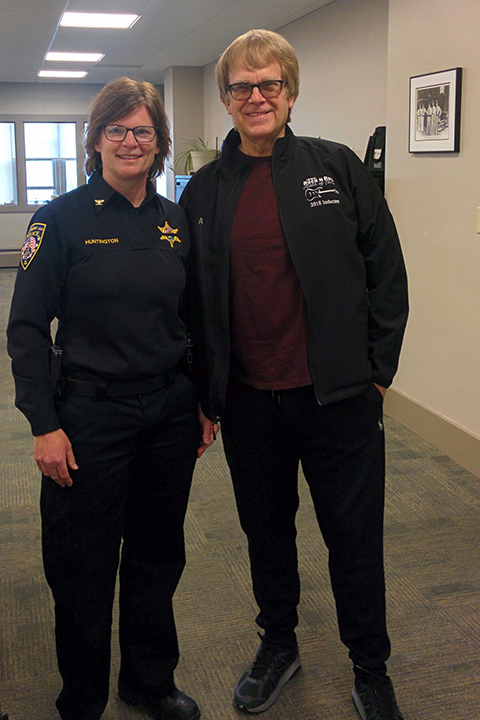 The next day we spent some time Galena, including dropping by the police station to deliver some signed copies of Girl Most Likely to Chief of Police Lori Huntington. The reviews for Girl Most Likely have been largely favorable, with the exception of a couple of nasty ones at Amazon (which have largely been terrific). One reviewer from Seattle finds the idea that Millennials would even bother having a ten-year class reunion “unlikely” (untrue) and finds the book “definitely written by a white man.” Hmmm…was it the author’s photo that gave it away? On the other hand, we had a very nice review – balanced but ultimately highly favorable – that was sent out by the Associated Press to papers all around the good ol’ USA. In the past week, the review has been appeared in 20 publications, at least, and probably many more (the 20 are just the ones that appear online). And the blog reviews are even better. I’ll list some links later in this update. If you received a copy of Girl Most Likely in my recent giveaway, and don’t agree that it’s “utter crap,” be sure to post a review at Amazon and elsewhere. A review by one of the getaway winners that Amazon wouldn’t publish – for no good reason – was easily posted at Barnes & Noble. Remember how I liked the Marvel Captain Marvel movie a while back? Well, I like the DC Captain Marvel movie even more, though the name “Captain Marvel” doesn’t appear anywhere in Shazam. Don’t be put off by the somewhat deceptive advertising that might make you think this is a kid’s movie – it’s more the equivalent of a YA novel, with plenty of adult themes and scary villainy, perhaps a little too safely political correct, but what the hell – diversity is here to stay and a good thing to honor in a movie that will have a large teen audience. What I like about it – beyond its acknowledged debt to Big (via a brief walking piano sequence) – is Shazam’s ability to be funny without completely sacrificing the darker elements expected these days. It’s kind of the anti-Deadpool, and I say this liking both of those films; but this has a good heart and the humor never walks the dark side – that’s left to the bad guys. Zachary Levi is the unnamed Captain Marvel and Asher Angel is Billy Batson, the kid who can turn himself into a super-hero with a word. The filmmakers go out of their way to honor the original source material – a comic book drummed out of business by DC in 1953! References to the C.C. Beck classic (Beck gets a co-creator screen credit with writer Bill Parker) are frequent, from the high school being named Fawcett (after the comic book’s original publisher) to setting up the most unlikely super-villain of all for a possible sequel. They even make a joke out of Billy Batson’s super alter-ego not having a name. Plus, we get appearances by Captain Marvel Jr. (also not named) and Mary Marvel. For a rapidly ageing comics fan, this was bliss. Do you want a plot summary? Just go to it, if nothing I’ve said here scares you off. On the television front, Barb and I continue to adore Schitt’s Creek, which has done much to quietly normalize the notion of gay romance and now marriage. The show is reportedly wrapping up after one more season, which is a shame but what a run they’ve had – a post-SCTV triumph rivaled only by Christopher Guest’s films, which also starred Eugene Levy and Catherine O’Hara. We also consumed the sixth season of the Morse prequel, Endeavor, and found it to be the strongest yet, and probably the best of the British crime series. A subtle aspect of these four movie-length episodes is the collision between the rough-and-tumble Sweeney style policing of the early ‘70s and the more cerebral Morse style policing of the late ‘80s-onward – both series having starred John Thaw, whose daughter Abigail is an Endeavor series regular. 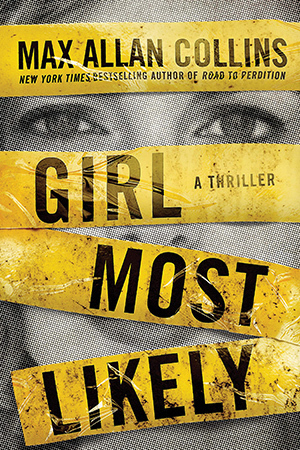 Here’s a nifty review of Girl Most Likely from bookfan. And a great one from Jonathan and Heather. Plus this one from Mrs. Mommy Booknerd. There is a third character named Captain Marvel, from MF Enterprises, and created by Carl burgos, who created the original Human Torch. I don’t think we have to worry about a movie featuring that guy.